Welcome to Day 1 of the UNofficial Photoshop Olympics. Today's event is Table Tennis. The Chinese are fierce competitors, that's for sure. Please stop back tomorrow for more of the UNofficial Photoshop Olympics. Word is there might be water involved. And you are far more relaxed! You go girl, we don't expect anything less than a gold medal! You two are the best! No, Katie, not... WATER! 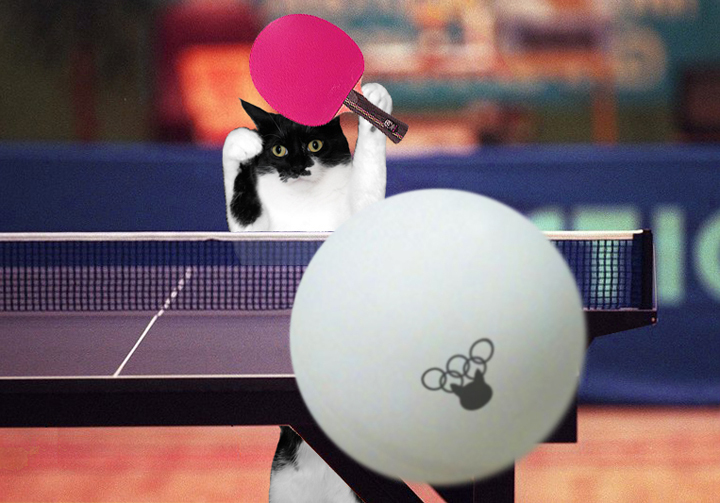 I don't know if I can come back tomorrow (even though you clearly pwned the humans at table tennis!). Definitely cuter! Looks like that one competitor is gonna get it right between the eyes! Great stuff, Katie. You are one fierce competitor as well Katie, and definitely cuter! Katie, of course you would excel in a sport with a ball. You have awesome concentration! Katie...and we know you are the winner!! Oh yeah...definitely cuter....but, you know what? Put a ping-pong ball in a bathtub and us cats will win everytime! That's pawsome! 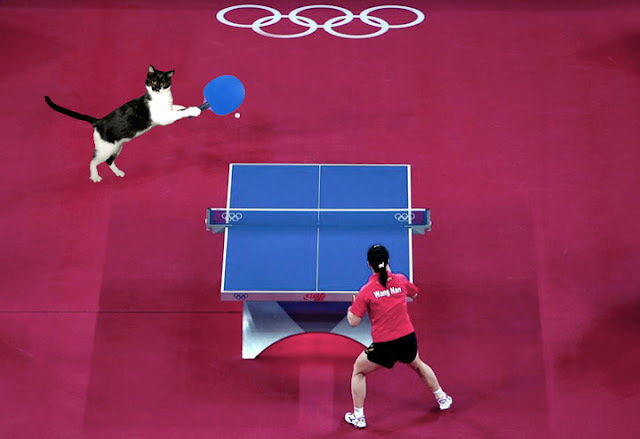 Fancy playing target games with a cat, there'll be only one winner - even I know that! And you don't cheat I bet cos you don't have to. 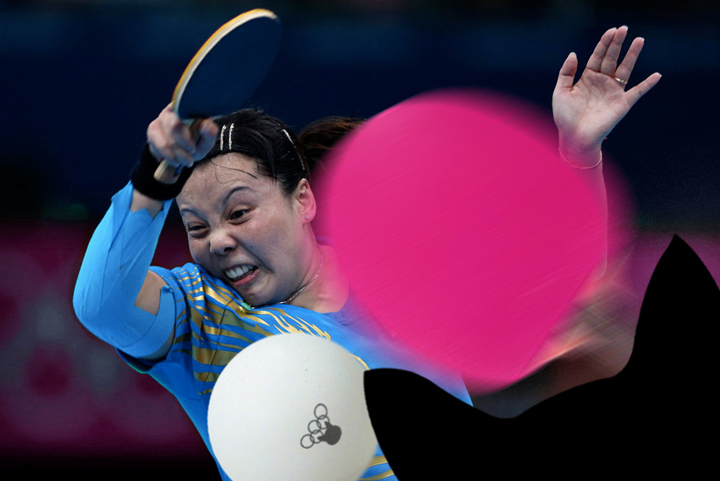 The peeps used to like to play table tennis before someone broke the table down in our gym. of course, it was never replaced. Cuter and smarter, fur sure! That's some great whappin Katie! that's one big paddle you're using. Katie, you are a force of nature! Hooray for team Katie, but me is curious... what is your national anthem? Whoa! Those two humans are SCARY looking! Katie! What about BADminton?? I bet there's some medals up for grabs there--and PLUS!!! it has a BIRDIE! Are you going to be diving??? You are all of that Katie, and she doesn't stand a chance against you. Wow Katie! 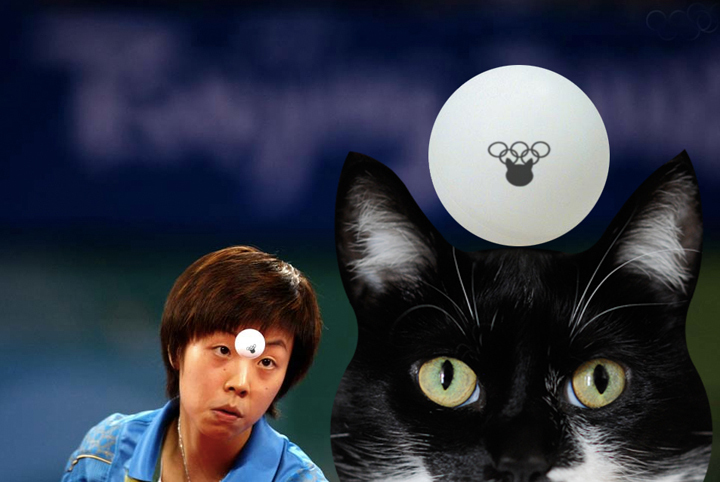 You are quite the table tennis player. Did you train with Forrest Gump?